If you think Twitter’s 140-character rule restrictive, the families of those killed in the First World War had a mere 66 to compose an inscription, an epitaph, for their relation’s headstone. 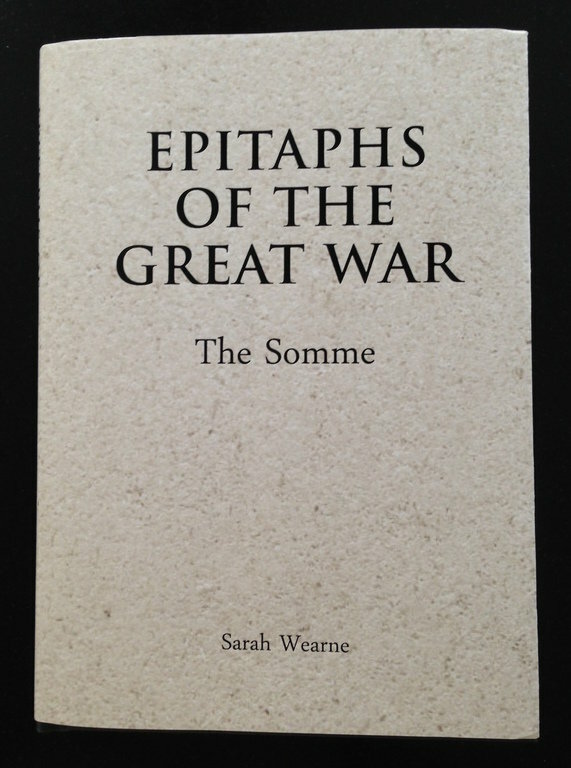 Throughout the centenary, @wwinscriptions will publish some of these thousands of inscriptions, revealing a voice that has not been heard before, the voice of the bereaved. A voice that speaks of love, sorrow, pride, grief and despair, it quotes the bible, literature, hymns and popular songs, and it tells us something about the dead, who they were, where they lived, what they looked like and how they died. In many cases the epitaphs use a language most of us don’t speak any more and by this I don’t mean the French, Latin, Welsh, Gaelic or Africaans that some relatives used, but the allusions and references that one hundred years ago were familiar to everyone. Who now recognises the quote, “The hours I’ve spent with thee dear heart are as a string of pearls to me” as coming from the number one best seller of Edwardian England, Florence L Barclay’s The Rosary, that “Go stranger tell our people we lie here having obeyed their word” references the Battle of Thermopylae in 480 BC, or that the simple dedication “Duty nobly done” is an acknowledgement of King George V’s letter to the Expeditionary Force on the eve of its departure for France – “I have implicit confidence in you my soldiers. Duty is your watchword, and I know your duty will be nobly done”? Bear in mind that the repatriation of bodies had been strictly forbidden, after May 1915 no one was allowed to bring a body home from the battlefields and the ban remained in force even when the war was over. And when the war was over, families were not allowed to choose their own headstones they had to accept the uniform headstone chosen by the War Graves Commission for all the war dead. Whatever the merits or demerits of these decisions – the cause of much public distress despite the fact that today the cemeteries are universally admired for their quiet dignity and restraint – they were final. This meant that choosing an inscription was not just the last contact families had with their dead but the only contact they had with them. This gave them huge significance. These inscriptions have been collected over more than 30 years of visiting battlefield cemeteries as well as some from John Laffin’s Australian Epitaphs of World War 1 (1995), Trefor Jones’ On Fames’s Eternal Camping Ground, Epitaphs in the British Cemeteries on the Western Front (2007), and from the recently uploaded records of the Commonwealth War Graves Commission.